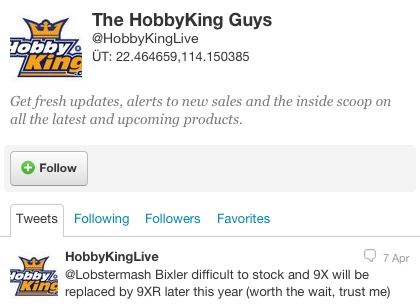 According to a reply HobbyKing posted on twitter, the 9x will be replaced by the 9XR later this year. Does anyone have more info on this radio? apparently photos late next month, awesome. I was just considering buying a 9x. Now I don't know if I should wait. Do you guys think the 9x will still sell for close to the same on eBay when the r is released? Maybe this time it will actually have a way to use the 9th channel. My 9x is on the slow boat from china right now, but Id love to hear about the 9xR. If the price is anything like the 9x has been, I don't mind popping for another Tx later this year or next. module based with inbuilt 2.4 antenna plus options for FASST, DSMX & long range 433mhz plus it looks & feels much nicer. Phew, that means my FrSky collection won't become obsolete anytime soon. Definitely keeping an eye on this one. If those rumors were true, wouldn't it be the Turnigy 14xR instead? It is a very good chance the new 9xr is FrSky, not Flysky. Frsky is supposedly developing a transmitter of their own. That would most likely be the new 9xr sold under Turnigy brand at Hobbyking. The FASST and DSMX compatibility is telltale to some extent. It is fun to speculate, isn't it.